Something is wrong when I look at the cars in town and see more mountain bikes than skis on their racks. I think the word is out. The mountain bike riding has been getting better as “winter” continues. 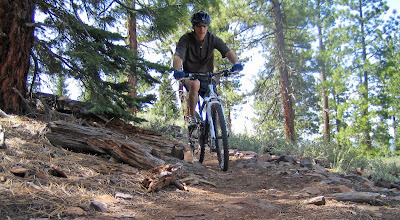 I rode the Sawtooth trail out of Truckee today. I rode the roads from downtown Truckee to the trailhead, but you can drive the 2 miles if you prefer. The Sawtooth trail is a single-track loop course 10 miles in length. The elevation varies from 6,200 to 6,400 feet. It’s a twisty, often rocky trail that affords spectacular views of the Truckee River Canyon. Today the trail was in good condition with a few hard packed snow crossings and a few muddy sections. Other than that, the trail was dry and dusty like summertime. You still have to be careful on the snow crossings, but they aren’t as slippery as the snow crossings were on the Emigrant Memorial trail trail I rode 2 weeks ago. Just the same, I heard that a biker recently crashed and injured her shoulder while crossing snow on the Sawtooth trail. From Historic Truckee, go East on Brockway Road. Turn right at the traffic light to Palisades Drive. Turn right on Silver Fir, then Left on Thelin Drive. Turn right at the (gated) forest service road. This is road USFS 06. Proceed ½ mile and park on the right. The trailhead leads West from here.